Welcome to ImpactWindows.net, your impact windows and doors blog that provides answers and specific information related to hurricane protection. This blog is your quick reference guide to the benefits of using impact-resistant windows and doors. Also known as hurricane impact windows, high-impact windows or impact-resistant windows, they are an excellent alternative to hurricane shutters or storm panels. What's the Wind-Borne Debris Region? Wind-borne debris regions are defined as areas along the Atlantic and Gulf Coasts where the design wind speed is 120 mph or above, or within one mile of the coastal mean high water line where the wind speed is 110 mph or above. In these regions, the standard requires the designer, either an engineer or an architect, to assume that the windows and doors will be broken by wind-borne debris unless those openings are protected against such items. Protection can be achieved through the use of hurricane shutters or impact-resistant glass. The wind-borne debris region extends about five miles inland in most cases and considerably further in others. But, in the Panhandle region (sections of northern Florida from the Walkula/Franklin County line to the western edge of Escambia County), the legislature designated the wind-borne region as the land within one-mile of the Gulf Coast. After Hurricane Andrew, in 1992, Miami-Dade County established the first requirements for wind-borne debris protection and developed test requirements that shutter and impact-resistant glazing systems must pass, under the code (Fla. Building Code § 1626). Since then, the American Society of Testing and Materials (ASTM) has developed testing standards. Products must pass one of these tests to be accepted for use where protection is required. The exception is plywood panels that conform to a set of prescribed specifications, according to Rick Dixon of the Florida Department of Community Affairs. 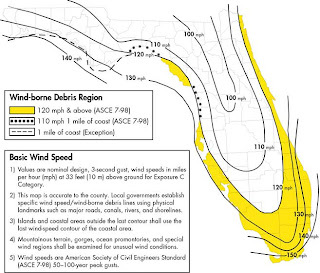 Today, the Florida Building Code uses the America Society of Civil Engineers Standard (ASCE) Standard 7 as the basis for establishing wind-borne debris regions and wind-borne debris protection. The standard requires builders either to (1) construct buildings that can withstand the additional pressure that results when wind gets into a building through a hole in the wall or broken door or window and pressurizes it (like blowing air into a balloon) or (2) protect glazed openings in walls (e. g. , windows and glass doors) from debris borne by high winds (refer to Florida Building Code, Chapter 16). Visit Astor Impact Windows for information about purchasing impact windows and doors. You can also email us at sales@astorusa.com or call us at 1-800-573-1780. Hurricane clips and straps that hold the roof structure to the walls. Roof coverings that meet FBC requirments. Exterior opening protection against wind-borne debris. For example, hurricane shutters, impact-resistant windows and doors. In order to find out which of these wind-resistive contruction features a property has, homeowners can hire a home inspection service company to field verify those features. These inspections take between 45 to 90 minutes depending on accessibility to home attics. Now, recently built homes are more probable to have some or all of the features described above. For example, homes built in Miami-Dade and Broward counties after 1994 are more likely to comply to have these features. For the rest of Florida, houses built after March 1st, 2002 needed to comply with the Florida Building Code which demanded these features. Please keep in mind that insurance companies offer windstorm premium discounts to structures that have wind-resistive construction features. Should You Consider the Impact Windows Option? Deciding whether to change the existing windows of a house is an important decision to make since windows have a significant influence on the ventilation, interior temperature and lighting of a house. Equally important, replacing windows is a major investment that makes a tremendous impact on the house's architectural identity. Therefore, when it is time for a window facelift, homeowners need the honest advice from a professional window company that can explain the advantages and disadvantages of the alternatives available to them. One of most important decision is to make a choice between purchasing standard-glass windows with hurricane shutters and installing impact-resistant windows that do not require shutter protection. Cost, convenience, appearance and time commitment are the four major differentiating factors to consider when choosing between standard-glass and impact-resistant windows. With regular, standard-glass windows, the Florida Building Code demands the installation of storm panels in every house opening in order to provide for hurricane protection. The combined initial cost of purchasing and installing standard windows with shutters is less than buying and installing impact-resistant windows. However, the cost comparison can change substantially over time if we factor the time commitment for installing and uninstalling storm panels every time there is a hurricane warning, especially if mounted panels are used. Impact windows’ and doors’ main design characteristics are the shatter-resistant glass securely fastened to a heavy-duty aluminum frame. The impact-resistant glazing consists of two layers of annealed or tempered glass bonded to an intermediate layer of a shatter-proof membrane. This membrane is typically made of Polyvinyl Butyral (PVB), a plastic film which varies from .015 to .090 inches in thickness, depending on the design pressures needed. If the outer glass breaks, the shattered pieces will adhere to the PVB film. In contrast, standard-glass windows are made of standard float glass that, when broken, will fracture in large sharp shards. Given these characteristics, it is very difficult for an intruder to break into a house through an opening with impact-resistant glass. Impact windows and doors are built of heavy-duty aluminum frame with double glazing panes which make the windows much more energy efficient. 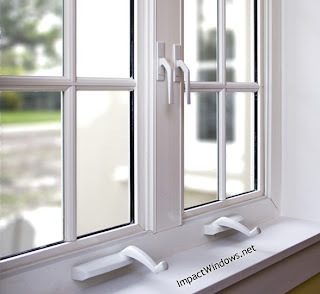 Impact windows provide excellent insulating capabilities, helping isolate interior spaces from the outdoor weather changes and contributing to important utility bill savings. If all of the house openings are protected with impact-resistant windows or doors, policyholders can obtain up to 45% premium discounts. In order to apply for the discount, homeowners need to call a home inspection company so they perform a wind certification inspection. 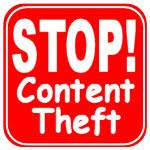 Check with your insurance carrier to obtain more information on the process. Impact-resistant windows and doors help reduce outdoor noise significantly. Homeowner testimonials confirm that impact-resistant glass is a great contributor to bringing peace and quiet environments inside the house or property. For people who live near busy intersections, highways or heavy traffic, installing windows and doors have proven to be an effective noise attenuation solution. Impact-resistant windows and doors provide 99% blockage of ultraviolet (U-V) light, protecting valuable interiors, including your favorite photographs, loveseat, Persian rug and even flooring, from fading or discoloring after repeated exposure to direct sunlight. This characteristic is particular important Florida residents who enjoy the direct sunshine all-year round. Also known as hurricane windows or high-impact windows, impact-resistant windows are an excellent alternative to hurricane shutters or storm panels. When struck by flying debris during a storm, they are designed to stay in one piece, protecting the building from the devastating effects of high winds. The main assembly difference between a standard and an impact-resistant window is that the latter is securely fastened to a heavy duty aluminum frame. Unlike the single-glazed design on standard windows, the impact-resistant glazing consists of two layers of annealed or tempered glass bonded to an intermediate layer of a shatter-proof membrane. This membrane is typically made of Polyvinyl Butyral (PVB), a plastic film which varies from .015 to .090 inches in thickness, depending on the design pressures needed. If the outer glass breaks, the shattered pieces will adhere to the PVB film. In contrast, standard-glass windows are made of standard float glass that, when broken, will fracture in large sharp shards. How to find out if the windows I am purchasing are real impact resistant? For a window or door system to be considered impact-resistant certified, it must meet testing standards set forth by the American Society for Testing and Materials (ASTM). One of the most rigorous requirements comes from the Florida Building Code which, given the increase in frequency and strength of hurricanes in recent years, has incorporated many of the lessons learned from prior hurricane-driven disasters. The Florida Building Code, for example, requires that every exterior opening in a structure be protected against wind-borne debris. This protection can be accomplished by either storm shutters or by impact-resistant windows and doors. To learn whether or not a product is considered impact resistant, ask your window dealer for a copy of the Notice of Acceptance (NOA) issued by the Miami-Dade County. The NOA is the document issued by the County which provides specific information, including dimensions, parts, materials, accessories and installation guidelines, about the particular product in question. The NOA certifies whether or not the product has passed the impact-resistant test. This product also sets forth an expiration date until which the approval has been issued for. NOAs can be downloaded at the Miami-Dade County's website. To qualify for these discounts, most insurance companies require a certification of the key construction features. These certifications must be approved by a professional engineer, registered architect or building official. The best cost-efficient way to obtain this certification is by calling a local home inspection company that offers the service. For more information, you can visit windloadcalculations.com which is one of the many companies that can provide the service. Carlos Paesano is the owner of Astor Windows and Doors, an impact-resistant window specialist based out of Miami, Florida. Astor Windows provides full service window installations for both residential and commercial applications.